RoyalEnfields.com: Why do white people like Royal Enfields? Why do white people like Royal Enfields? We will know for sure that Royal Enfield motorcycles are "cool" if and when they are ever featured on the blog Stuff White People Like. "Within white culture, your choice of transportation method says a lot about you. For example a Prius says you care about the Earth, a bicycle shows you REALLY care about the earth, and a bus shows that you are probably not white. But these three options are not the only viable ways for a white person to get around, they have literally dozens of choices including Volvos, old Mercedes that run on vegetable oil, Subaru Outbacks, and Vespa Scooters." To enjoy Stuff White People Like you have to have enough of a sense of humor to realize that joking about racial stereotypes is not always worth complaining about to the Supreme Court. Most of it is pretty gentle stuff. For instance, Stuff White People Like concludes that white people must like scarves because they can not control their body temperatures. The blog's take on Vespas is similarly gentle and mostly true. Bottom line: "In fact, were it to have a liberal arts degree and a steady income, a Vespa scooter would possesses every important quality that a white person looks for in a spouse." Nothing in the blog implies that only white people like Vespas, or scarves. 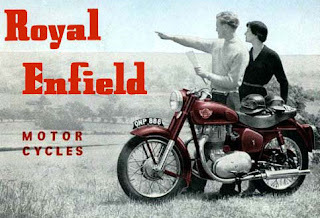 We know that everyone around the world loves Royal Enfields. But like a spouse? I'm not sure Royal Enfield merits such praise. Possibly, being beautiful, loyal (but not overly reliable) and relatively cheap to keep, a Royal Enfield motorcycle could be described as having all the qualities a white person looks for in a mistress. Thank you for the tip, Erin. I laughed a lot. "a Royal Enfield motorcycle...all the qualities a white person looks for in a mistress." Haha! A timely tagline too. I can see that in some cases a Bullet having the qualities of a desireable Mistress might just work, I have such a gal in my 500!